Sterling Silver, Turquoise, Magenta Turquoise, Red Oyster Shell, Yellow Mother of Pearl, Black Jade, and Opal. This cuff bracelet will complement any wrist beautifully! 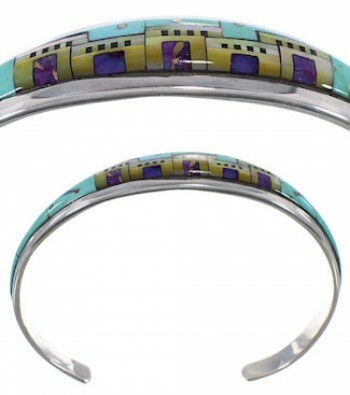 This bracelet is a stunning piece of jewelry that is hand crafted out of genuine sterling silver and Multicolor inlay. The inlay consists of: real Turquoise, Magenta Turquoise, Red Oyster Shell, Yellow Mother of Pearl, Black Jade, and man made Opal. This piece features outstanding detailed inlay work that forms a gorgeous Native American Village or Pueblo Design. In this scene, a village can be seen under a glorious sky full of stars! The inlay is carefully set on a silver cuff for a remarkable finish. The bracelet is stamped sterling and hallmarked.